The 47th World Science Fiction Convention (where they give the Hugo Awards) is in Kansas City, Missouri August 17-21. I’m moderating a panel called “The Real Martians” on Friday at 4 pm. One of the topics we will address is terraforming Mars. Could we? Should we? The term terraforming, which means to transform a world to support human life, was coined by science fiction writer Jack Williamson in 1942. According to BestScienceFictionBooks.com, the concept dates back to H.G. Wells’ 1898 book, The War of the Worlds, where the invading Martians planned to reverse-terraform (?marsaform) Earth. 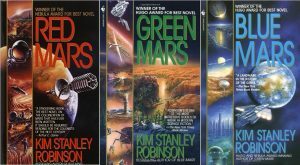 Caption: Red (1992), Green (1993), Blue Mars (1996) trilogy by Kim Stanley Robinson is considered one of the best and most complete treatment of terraforming in fiction. I say qualified because Mars will always be different from Earth in ways that aren’t feasible to change. Mars is smaller, farther from the sun, and lacks a magnetic field (which helps, but is not essential to protect Earth from radiation). So terraforming Mars really means changing the temperature and atmosphere to make living there easier. The key to warming Mars is to thaw the carbon dioxide (dry ice) at the south pole. Unlike water ice, dry ice changes directly from a solid to a gas when heated. Carbon dioxide absorbs heat from the sun that would otherwise be radiated back into space, like the glass of a greenhouse traps the warm air inside. The “greenhouse effect” of increased carbon dioxide will thus spur the thawing of more dry ice and water ice that is now frozen in the dirt. A thicker atmosphere would block radiation harmful to life and allow water to circulate. Some plants and animals could then survive on the surface in about 100 years, though there wouldn’t be enough oxygen for humans to breathe for a thousand years or more. To thaw the south pole, more sunlight could be directed there via giant reflectors in orbit. Covering the white ice with black dust would increase absorption. If we need more gas to jumpstart greenhouse warming, we might divert some comets containing ammonia to Mars. The question of “Should we?” terraform Mars is addressed in a paper, “Planetary Ecosynthesis on Mars,” by NASA planetary scientist Chris McKay. He points out that even if we are successful, the same geologic processes that robbed Mars of its early atmosphere will do so again in 10 to 100 million years. So why bother? McKay argues that warming Mars “could be of great utilitarian value for humans in terms of the knowledge derived ranging from basic biology to global ecology.” He also notes that any life on Mars today is at risk of extinction if we do NOT thicken the atmosphere. I therefore answer the “Should we?” warm Mars with a “Yes.” Once we are on Mars, the expense to terraform will be minimal in comparison. And the knowledge gained by “controlling” another biosphere may be the ultimate space spinoff by showing us how to keep Earth habitable and also how to adapt to live elsewhere when the sun brightens and toasts the Earth in about 500 million years. What do you think? Come and share your thoughts with “The Real Martians” at Worldcon! 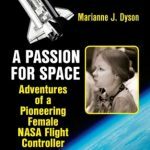 Bring your copy of Welcome to Mars or any of my other books to the Science Fiction and Fantasy Writers of America (SFWA) table in the Exhibit Hall at Worldcon on Friday, August 19 from 1-2 pm to get them signed or just to chat with me about space topics. I’m not allowed to sell books at the SFWA table, so order them ahead of time from Amazon or via my website. August 17-21, MidAmeriCon II, the 74th Science Fiction Worldcon, Kansas City, MO. Friday: signing at the SFWA table in the Exhibit Hall, 1-2 pm. “The Real Martians” panel at is in room 2201 at 4 pm. At 9 pm, join me in room 2502B where we will gather to then go outside (weather permitting) for night sky observing (with my 70mm binoculars). Saturday I’ll be at the SFWA business meeting 10 to noon and volunteering in the SFWA suite 2-4 pm. Sunday I’m on the “Next Year at 100k” panel about commercial space at 11-am. My MidAmeriCon schedule.